Product code: R708 Categories: Sold Items, Sold Rings. 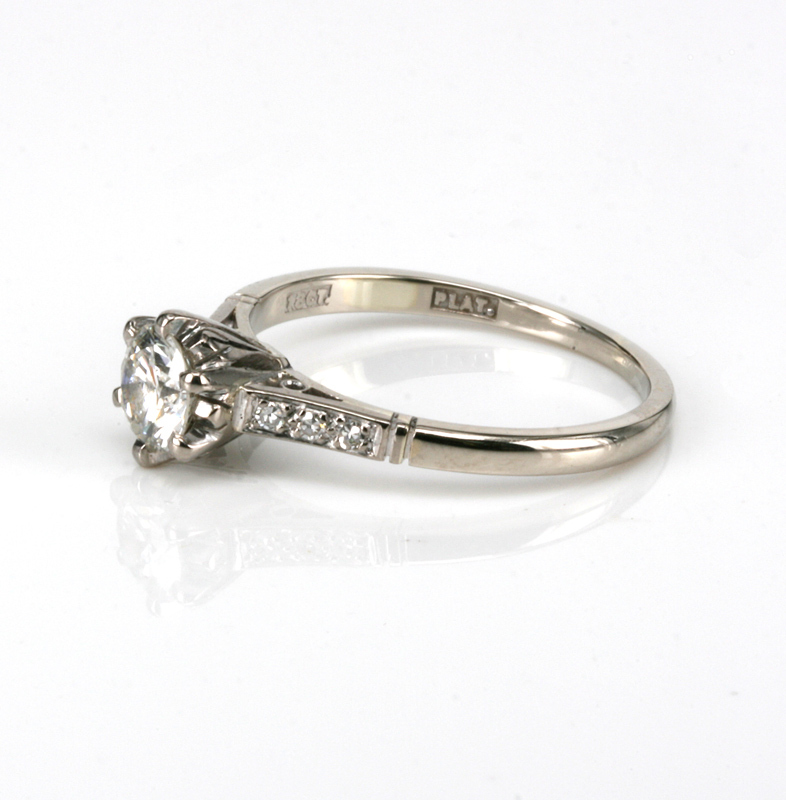 An engagement ring is always the most special ring on your hand, and here is a very elegant and beautiful Art Deco diamond engagement ring that sits perfectly on the finger and is destined to always be loved and cherished. Hand made in 18ct white gold and platinum, the design of the ring is so elegant and sitting proudly in the centre is a vibrant round brilliant cut diamond that measures 0.58 carats and is G in colour and VS in clarity. What this means is that the diamond is in the white range in colour and has no inclusions that are visible to the naked eye and the sparkle from this diamond is made even more beautiful by the claw setting allowing the maximum amount of light to enter the diamond. Then on each side are three more diamonds that add just the right amount of sparkle and elegance and these additional diamonds total 0.06 carats. From the end of one diamond across to the other end, this distance measures 13.5mm by 7mm wide at the centre. 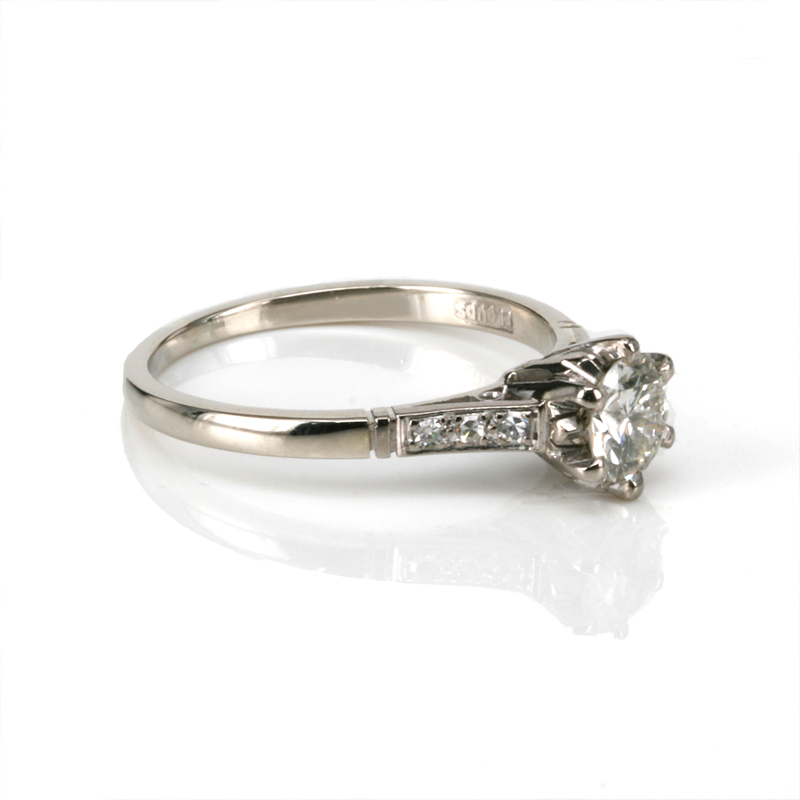 Such a perfect and elegant Art Deco era diamond engagement ring, this will make any woman say “Yes!” and wear it with so much pride.